PITTSBURGH (AP) — Tyler Matakevich’s signature red beard is a jagged mess. The Pittsburgh Steelers linebacker knows it’s time for a trim but he’s a little particular about the way he wants it cut, so Matakevich decided to hold off until he could get back home to Connecticut, where a good friend has doubled as his barber for years. “I sort of forgot that it’s a little different when it’s hot out,” Matakevich said with a laugh. The player nicknamed “Dirty Red” by coach Mike Tomlin as a rookie two years ago expects to have the beard a little more under control when the Steelers report for training camp next month. Considering the workload Matakevich could carry in 2018, that’s probably wise. The seventh-round pick in 2016 will be given every chance to earn the starting linebacker spot created by Ryan Shazier’s spinal injury. When Matakevich wasn’t sure about a specific coverage during a workout on Tuesday, he trotted over to Shazier’s golf cart and started peppering him with questions. Still, Matakevich carved out a roster spot by making himself a special teams ace — he’s already blocked two punts in two seasons — and is keenly aware that in most places the prospects for seventh-rounders is iffy at best. Pittsburgh, however, is not most places. Inside linebackers coach Jerry Olsavsky understands Matakevich isn’t Shazier or former Steeler Lawrence Timmons, but he is refusing to hold Matakevich to a different standard. Shortly after Shazier’s wrenching exit, Matakevich found himself on the sideline when the left shoulder problems he’d been battling all season simply became too much to bear. He spent most of the season wearing a harness during games to protect it after initially tweaking his labrum in Kansas City in mid-October. There’s a small three-inch scar on the front of Matakevich’s left shoulder, a reminder of the procedure that took care of his labrum, his rotator cuff and his biceps in one fell swoop. The arm that he admits was “just hanging there” for much of last season is now fully healthy. The front office is so encouraged by Matakevich’s progress it opted not to use a draft pick on a linebacker for the first time since 2010. 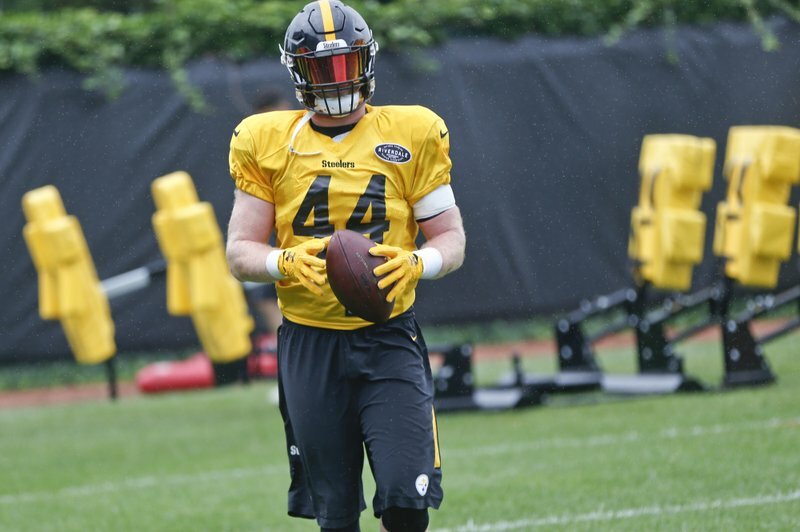 General manager Kevin Colbert made it a point to bring up Matakevich’s name unprompted in the aftermath and Matakevich heard the message loud and clear even as the team signed well-traveled veteran Jon Bostic as insurance. “It makes you really believe in yourself because you know that the guys upstairs believe in you,” Matakevich said. There’s no question that Matakevich has earned the belief of the guy he may line up alongside. In many ways he’s following in Vince Williams’ footsteps. A former sixth-round pick himself, Williams is now the elder statesmen in the linebackers’ room thanks in part to his skill and work ethic. He sees the same things in Matakevich. Well that and maybe a haircut by the time the team reports to Saint Vincent College on July 25, when Tomlin is expected to shout “Dirty Red” early and often. That’s fine by Matakevich.